Some days I have classes really early, so I was looking for the perfect breakfast bar recipe that would be filling and last for a long time in the fridge (so I don't have to start baking weekly before class!). Of course, I also wanted to look forward to eating this thing early in the morning. After some searching around the internet, I didn't find any recipe that seemed just right, so of course I just mashed together a couple of recipes and then took it from there to make up my own. I took inspiration from recipes by Alton Brown and another blog I found called One Hundred Eggs. Actually, the baking instructions are almost entirely from the latter, as the method of cooking these bars generally stays the same. 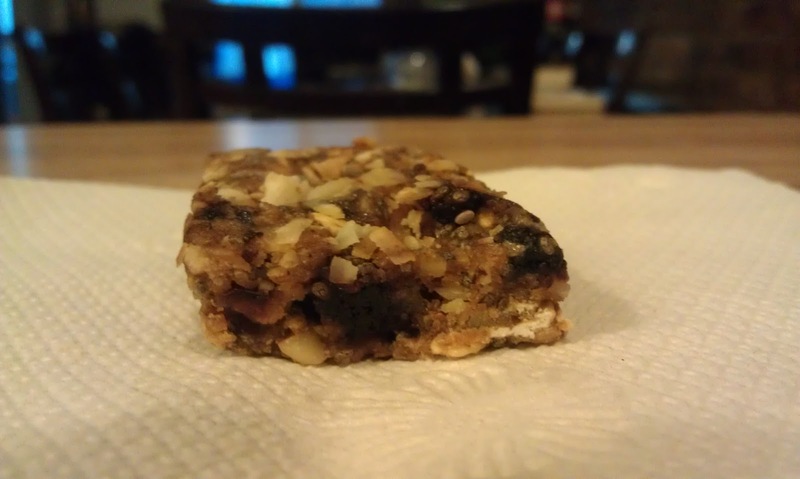 It's a pretty flexible recipe in general, so you should feel free to swap some of the dried fruit for other dried fruit you like, or some of the nuts for other kinds of nuts. 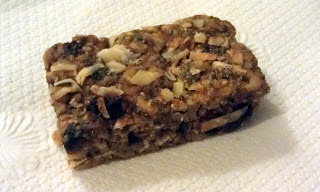 Just make sure the moisture to dry content ratio stays about the same to get the chewy bar texture we're seeking here. Preheat the oven to 350º F. Lightly oil an 8 inch square pan, line with parchment paper, and lightly oil the parchment. In a large bowl, loosely mix together the first ingredients. Process (in batches, if necessary) in a food processor until the mixture is finely chopped. Meanwhile, in the large bowl, whisk together the second set of ingredients. Add the chopped oat and fruit mixture, and mix until evenly blended. In a bowl, whisk together the maple syrup and eggs. Add to the dry ingredients, and stir until all dry ingredients are moistened (mixture will be very stiff). Add the water by tablespoons as needed to fully moisten. Transfer the mixture to the prepared baking dish. Using a nonstick spatula or moistened hands, press the mixture firmly and evenly into the pan. Sprinkle coconut. Bake at 350º F for about 25 minutes, or until lightly browned on the edges and just set in the middle. Let cool before slicing into 12 bars. Bars can be individually wrapped, and frozen or refrigerated. Mmm. Can I get a sample?